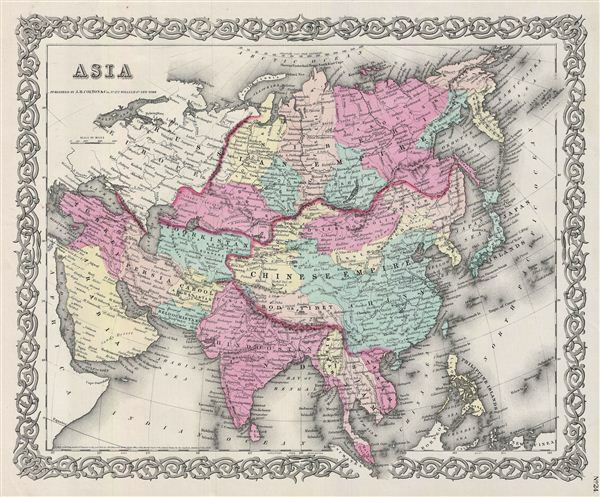 An excellent 1855 first edition example of Colton's map of Asia. Like most of Colton's Asia maps, this map was derived from an earlier wall map of the world produced by Colton and D. Griffing Johnson. The map covers the entire continent from the Mediterranean to Siberia and from the Arctic to Singapore. Tibet, Korea and Ladak are within the borders of the Chinese empire. Colton identifies both the Great Wall and the Great Canal in China. Taiwan or Formosa is mapped vaguely, representing the poor knowledge of the region prior to the Japanese invasion and subsequent survey work of 1895. Afghanistan is divided into Cabool (Kabul) and the southern province of Beloochistan (Baluchistan). The map also includes parts of europe and the Arabian Peninsula. As this map was drawn, Imperial China wilted under the weak Qing Dynasty while the Russia attained the height of its pan-continental expansion. Turkey and the Middle east were under waning Ottoman hegemony. In India, a year after this map was made, in 1857, the sepoys of the British east Indian Company revolted in India's First War of Independence. This would ultimately lead to the dissolution of the east India Company and governance of India would falling under the direct rule of the British Crown. This map also identifies various cities, towns, rivers, rapids, mountain passes, and an assortment of additional topographical details. Names Singapore, Hong Kong, Macao, Beijing, Shanghai, edo (Yedo or Tokyo), Mecca, and countless other important cities. Map is hand colored in pink, green, yellow and blue pastels to define national and regional boundaries. Surrounded by Colton's typical spiral motif border. Dated and copyrighted to J. H. Colton, 1855. Published from Colton's 172 William Street Office in New York City. Issued as page no. 24 in volume 2 of Colton's 1856 Atlas of the World. Rumsey 0149.091 (1856 edition). Phillips (Atlases) 816.